There are usually a lot of parked cars in this large square during the day but at this time, in the early evening, the majority of them have gone. 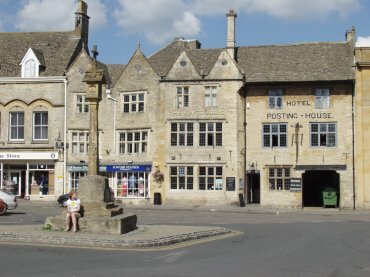 We stayed at the Old Stocks Hotel, which is in another part of this square, for the duration of our visit in July 2005. 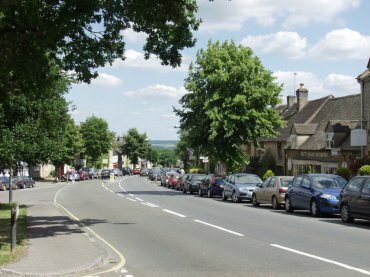 Stow-on-the-Wold is the highest town in the Cotswolds at 700 feet. 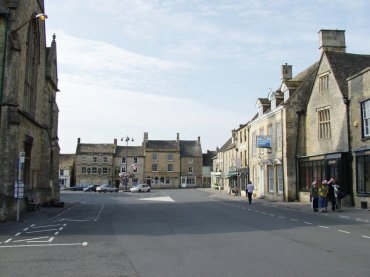 The Market Cross and the Kings Arms, Stow-on-the-Wold. A relic from Stow's past is the Market Cross, a symbol of the town's former importance. The Kings Arms is a 16th century coaching inn where the main entrance was through the arch leading to the stables. Charles I stayed here at the time of the Battle of Naseby in 1645. It featured as The Kings Arms in the television production of Thomas Hardy's 'Mayor of Casterbridge'. These buildings are made of the local Costswold stone with it's distinctive yellow colour. The Parish Church of St. Edward. The building of this church started in the 11th century but wasn't finished until the 15th century when the tower was completed. The church sits in a nice little churchyard in the centre of the town just behind the Market Place. You can see from the distant landscape view that Stow is actually on a Wold (hill). This road runs east towards Upper and Lower Oddington, hence the name, and thence to Adlestrop. 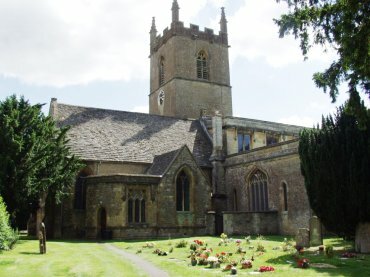 Adlestrop is the village mentioned in Edward Thomas's famous poem written when has was at the front in the first world war. He was later killed in action at the Battle of Arras in 1917.